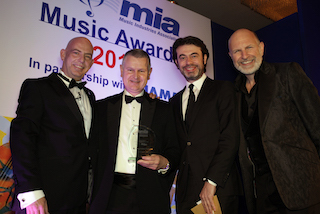 HAMBURG, Germany — November 16, 2015 — Steinberg Media Technologies GmbH receive the 2015 Music Software of the Year award, as sponsored by Computer Music magazine, at the Music Industries Association (MIA) awards ceremony. Celebrations took place in the Hilton London Metropole last Thursday, honoring best products of the musical instrument and professional audio industry over many categories. Steinberg’s latest music production system, Cubase Pro 8, wins 2015 Music Software of the Year award, as sponsored by Computer Music magazine, at the MIA awards night. The award was designed to celebrate the very best in performance, quality, value for money and retail success. It was voted for by the general public. Condensing virtually three decades of development into a cutting-edge DAW, Cubase Pro combines exceptional audio quality and intuitive handling with a collection of highly advanced audio and MIDI tools. The Music Industries Association is the trade association in the United Kingdom that represents the music-making industry. Members include the manufacturers, distributors, publishers, retailers and educators of instruments and associated products. Steinberg have been at the forefront of innovation in the field of audio technology since 1984. Delivering technologically advanced solutions for music and media production pursuant to the motto “Creativity First,” musicians and producers of music and film continue to rely on Steinberg and their award-winning products. “It was a great evening, topped off with winning this amazing award. Cubase Pro 8 has reached a new standard in music software, and I’m delighted to have accepted this extremely prestigious award on behalf of all at Steinberg,” said Richard Llewellyn, UK Education Manager. Visit www.miamusicawards.com for details on the award show. Steinberg is known the world over for its music and audio software and hardware solutions. The company has been developing, manufacturing and selling innovative products for musicians and producers in the music, film, post production, and multimedia industries since 1984. Steinberg products are used by Grammy and Oscar award-winning composers, engineers and producers. The company also offers business customers license-management and copy-protection systems. Up to 40% Off ALL 8Dio Products (incl. bundles) & 50% Off ALL 8DM.